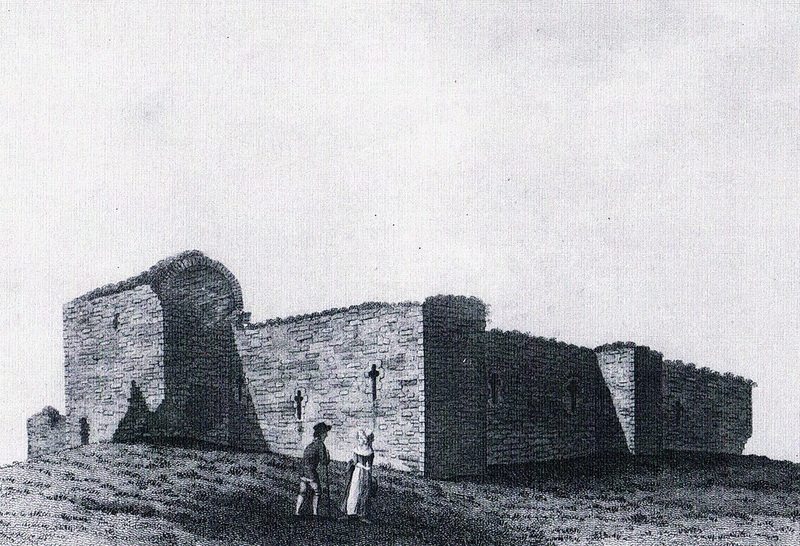 km south west of Clonmore and similar to it, this ruined castle dates to the thirteenth-century. The castle is striking as it is unusual - comprises courtyard about 80 feet square, surrounded by granite walls, 8 feet iick and 20 feet high. Square towers project from three sides while a formidable gatehouse is the feature of the fourth. The interior of the castle is now bare but originally featured two-storey structures built up against the inner walls. The castle was most probably built by Roger Igod or by a member of the Carew family. Access is direct from the Bagenalstown - Fenagh Road via a small timber footbridge. and a moat outside. 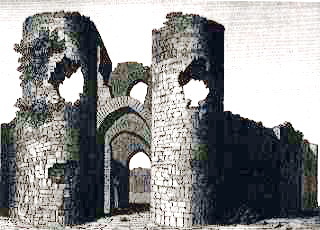 Only a small square rower remains, as well as the entrance gate which flanked by two large rounded towers. The castle originally belonged the Kavanaghs before passing into the hands of the Bagenal family in nearby Bagnalstown and following this the Bruen family in the early nineteenth century . Access is direct, on private land. Odd notes that will eventually find a home ! 1395 On 16 February in a certain field vulgarly called Balygory by the town of Carlow,( another source states it is 2 miles from Tullow) on the side of Slievemargy, there was a dramatic meeting. Nottingham, with some of his following, met Gerald O'Byrne and Donal O'Nolan, captain of his nation, coming from a wood where many armed Irishmen were assembled, and had the letters patent of se February read, first in Latin, and then translated into English and Irish by a Hospitaller, 'learned in the Irish tongue'. Then the principal Leinster chiefs, including MacMurrough himself, successively did homage in Irish. On the next two days, at Carlow and Castledermot, some minor personages came in. Then on in February in Dublin Donat O'Byrne, who had done homage there the day before, swore before the king himself to observe the agreement of 7 January. The submission of Leinster was thus complete, though on Richard's journey southwards in March a number of the Leinstersncn also took oath to the king in person. Charles Byrne of Clonmore lived around 1705 -1790. Donat O'Byrne's origins are unknown at present. ?